About 260 years ago, Douwe Egberts’ coffee was first roasted and tasted in the tiniest of rural Dutch villages. In the meanwhile, Douwe Egberts has traveled the world and has reached the shores of the tropical island of Curacao. 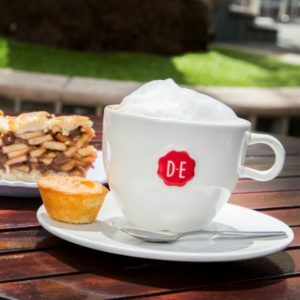 Savor some Dutch glory in a cup: try our grand Espresso or a friendly Heavenly Hazel. Start your day with us or enjoy our freshly baked baguettes for lunch and our famous homemade apple pie.